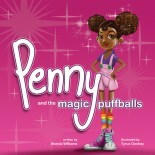 As an Ambassador, your job will be to represent the Penny brand by passing out stickers and/or books to puffball princesses you see around your area. If it is ok with their parents , please take a picture and post to the Facebook site. That is all I ask. Make a little girl smile. The next Ambassador packages will go out in mid-April. If you are interested in being a Puffball Ambassador, please complete the form below. Inspire the young and the world will be inspired by Greatness!